We are an aspiring group of around ninety singers who enjoy getting together to make music. Covering a wide spectrum of ages and life experiences, we are friendly and helpful to old hands and newcomers alike. Our three concerts a year promise to be very exciting under the baton of our Music Director Dr Nicholas Scott-Burt. Two workshops each year are led by trained musicians to help improve our singing skills. We perform with excellent professional soloists, and have enjoyed working with leading orchestras. We have taken part with other local choirs in festivals at Althorp and in the Derngate Theatre, Northampton. We are prepared to tackle new works: we commissioned and performed David Fisher’s Requiem and gave the world première performance of Alan Charlton’s Jubilate Deo. If you would like to collaborate with us please click here to e-mail our Chairman. 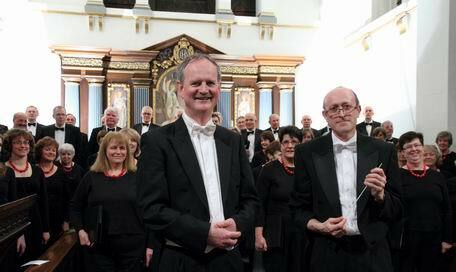 We are a well-known choir in Daventry and district and welcome the opportunity to work with other choirs and groups. We have sung Verdi’s Requiem with the Royal Philharmonic Orchestra and Northampton Bach Choir as well as Beethoven’s Choral Symphony. We were delighted to be invited by Owain Arwel Hughes to join him in June 2010 in a Grand Opera Gala at the Royal Albert Hall with the Royal Philharmonic Orchestra, the Royal Choral Society and Northampton Bach Choir. We appreciate generous sponsorship from local firms and individuals.